Henneke Maljaars at Oceanstyle in London tells me that there'll be an opportunity for brokers to view Mangusta's 39.6m megayacht Ability on Thursday, October 22nd from 1pm to 5pm. The location is Berth 6, at Flisvos Marina in Athens, where Captain Manthos Gaitis and his crew promise a warm welcome, with light refreshments being served about the megayacht. Built by the Overmarine yard in 2004, Ability had a total interior refit in 2008 and recently completed further major yard works bringing her up to 'as new' condition. 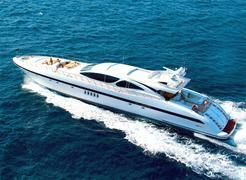 Sleeping up to nine guests in four cabins, she's currently asking €9.95 million.